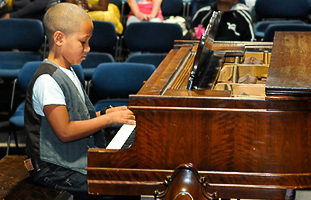 In partnership with teachers from KEYS, Kids Empowered by Your Support (keysmusic.org), FTC provides music education for elementary and middle school music students from the Bridgeport public schools - Columbus, Beardsley, Johnson, Marin and the Roosevelt School – among others. Currently FTC and KEYS provide a nine-month series of music workshops held on Saturdays from January to June. The series of Saturday classes is a mix of small intensives - one-to-one student-teacher ratio, as well as day-long workshops for dozens of students in classical guitar, violin, cello, jazz improvisation, singing and percussion. Subjects taught include technique, reading music and collaborative playing. The classes end with a short recital with professional musicians who perform at StageOne. KEYS, a Connecticut-based nonprofit provides private cello, piano, violin, and classical guitar lessons, taught by experienced instructors, during the school day to Bridgeport children whose families do not have the means to pay for music instruction. KEYS also conducts music awareness, music fundamentals, group recorder, and group choral lessons, all on school grounds, both after-school and during the summer.